Eric Holt, Reliability Engineer with Michelin Tires, gave a presentation during Day 1 of UE Systems' annual Ultrasound World Conference held in Clearwater Beach, Florida. Eric had attended the conference in 2016, but this year was his first as a presenter. In his talk, "Using what we learn to make a difference," Eric began with a safety message from Michelin highlighting the importance of tire inflation. What does that have to do with reliability and predictive maintenance? Indirectly, it was a reminder that safety is always the No. 1 priority, and that no matter what else is going on with your plant, it's the one area that must always be top of mind. From there, Eric shared his experience implementing tools, tips, applications and general knowledge he picked up from places like Ultrasound World. By introducing ultrasound tools and PdM techniques, Eric has been able to drive better maintenance practices and create a sustainable program that could be replicated in other plants within the organization. We caught up with Eric after the conference to glean some more insight from his expertise! 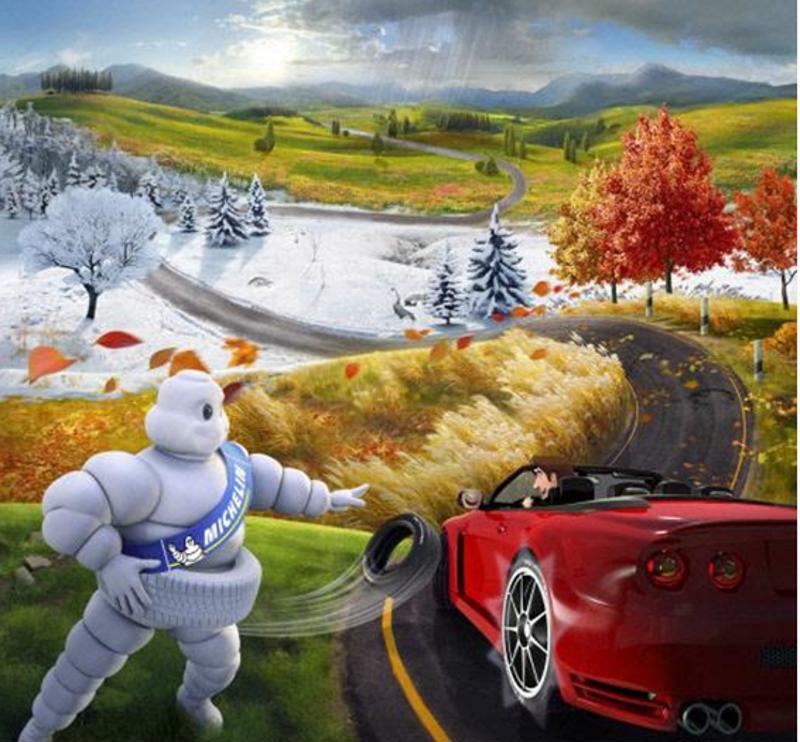 Did you know the Michelin Man's real name is Bibendum? What's been your path at Michelin? I'm going on 16 years at the company but I got my start as a student working at Michelin through Michelin's Tech Scholar program. At that point I was working on a degree in industrial electronics when I was hired full time as a maintenance troubleshooter technician. At Michelin, you have to pass a test to advance in the company, and I ended up reaching the highest technician level in Michelin. I asked myself, "What's next?" So later, I earned my mechanical engineering degree from University of South Carolina, which Michelin funded in its entirety. Toward the end of getting my 4-year degree I was a maintenance planner, followed by a short stint in machine installation. I spent my first 12 years at Michelin's Earthmover tire plant – those giant, 13-foot tall tires that give the "WOW factor" – and then moved over to the Michelin Car tire plant. Both in Lexington, South Carolina. It wasn't a huge move, but the change of pace was drastic – an earthmover tire takes hours and hours, while a car tire takes minutes. We can turn out over 30,000 car tires a day! After leading the installation of machines, I accepted a new job as a Reliability Engineer within the plant's Reliability and Methods Group. I get to work on improving methods and PM's, leading total productive maintenance events and RCA's, and use predictive tools. My favorite and primary predictive maintenance involvement is with ultrasound and infrared. How did you first find out about Ultrasound World and Reliable Asset World? So this is my second year. I attended UE System's ultrasound class to get my Level 2 Airborne Ultrasound Certification with Mark Goodman as the instructor. Goodman suggested that I attend Ultrasound World, saying, "You'll probably learn more there than you will in my class." I took him up on his word and it turned out he was right! Ultrasound World and Reliability Asset World inspired me and taught me a lot about what you can do with ultrasound and other tools. Your talk was titled, "Using what we learn to make a difference." What have you learned from past conferences? I actually gained some influence from last year's keynote by Ron Bitely, "What is your North Star?" After that presentation, I knew I had to find myself a North Star. Starting with ultrasound and infrared and determined how I could improve my own plant. There were a several other presentations that inspired me. What we do with ultrasound now at Michelin – air, steam, leak detection, gearbox, motor tuning – a lot of that stuff came from seeing how other presenters at the conference used these tools in their own situation. In addition, other presenters touched on improving organizations' structure and collaboration. I found out other plants within Michelin had been using it. Now, we have much better communication across facilities. How have you been able to use ultrasound in your own plant now? Ultrasound was used before I got to the plant, but not to its potential. Prior to my involvement, it was more of a spot-check system – pull it out, put it back after you check an air leak. But even then, when I first got to it, I had to knock the dust off the case. I started using ultrasound before I even really had the training – just some Google research. "We were able to find out which gearboxed were bad before they failed." One of the first things we did was to try it out on a small gearbox. We kept having gearboxes fail, so we decided to see what we could do to find out why using ultrasound. After listening to the gearboxes, we started to discover which ones were bad before they failed, and managed to change out failing gearbox assembly before the equipment broke down. It gave us much more control – now it's a planned breakdown instead of an unscheduled breakdown. As it turned out, for many of these failing gearboxes, the drives that controlled the motors weren't tuned correctly. They were just going from high-speeds straight to a stop. I noted in my presentation, you wouldn't slam on the breaks when you're driving on the highway every time you want to stop. So using ultrasound helped us tune the drive parameters to keep the gears from slapping together so quickly. Then we even took it a step further and used ultrasound to improve the cycle time. What advice do you have for anyone new to the conference? Talk to the presenters, talk to people – come with some questions. When I first went, I didn't really know what to expect, but I took a lot of notes. It's really nice to have those notes, because through the year you forget about what's presented but you can look back through your notes and recall old ideas or concepts that can still be useful. Jot down ideas, things you'd like to do back at the plant and make sure to look back at them. Thanks for your time, Eric! Eric Holt spends his spare time playing tennis, riding bikes and brewing beer – in fact, some of his creations have won awards at local craft beer competitions! Be sure to check out the rest of our coverage from Ultrasound World XIII and Reliable Asset World IV.